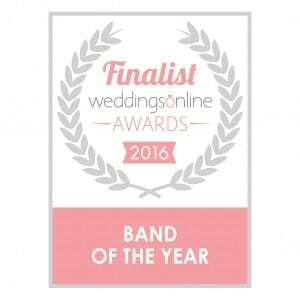 We are delighted to announce that Blush Wedding Music Ireland are finalists in the ‘Best Wedding Bands’ category in the Weddings Online 2016 awards. This is the fifth year that Blush Wedding Music has been a finalist in the awards and hopefully the third year that we take home the Band of the Year prize! We would like to thank everyone who voted for us in the category and we look forward to a fantastic party on the night! Why Book Blush Wedding Music? Blush Wedding Music are an award winning wedding music supplier, offering services nationwide. We are the only wedding music provider in Ireland that host fortnightly showcases that offer you a full day music package – ceremony, pre reception, band, DJ and late night piano. You may select from one, more, or all of our musical offerings. Check out our testimonials page here, where you can see feedback from happy couples who booked Blush for their wedding day. When you book Blush, we maintain constant contact with you in the lead up to your wedding day to ensure all your requirements are met. This includes ensuring that timings, the first dance, the father and daughter song, the bouquet/garter throw etc. go off without a hitch. In addition, we are now introducing a ‘song selection’ showcase in a private mini theatre, providing complimentary champagne to our clients where they can choose their favourite music for the big day. Just ask Enda (+353872906507) for details of the next showcase. In short, if you’re looking for the best wedding band in Ireland or the best wedding choir in Ireland, you’re in the right place! Visit our contact page to get in touch. All rights reserved. Web Development by Hatchmedia.